We would like to wish all our readers, customers and Seagreens fans a very Merry Christmas and Happy New Year. We hope you have a lovely, peaceful and restful time. Many of my recipes seem to be about eating healthy meals, but what about healthy snacks or appetisers before a meal? A quick to make snack and a more healthy option than many of the cheesy and high fat dips in the supermarket is Hummus. Made from chickpeas and tahini, a sesame seed paste it can be whizzed up in a few minutes and served with warm pitta bread, breadsticks and crudités. It is a great way to get kids experimenting with raw vegetables and my favourites are celery sticks, carrots, peppers and broccoli. It is also one of those recipes that once you have a basic dish you can make different varieties by adding other ingredients. Coriander works well as does caramelised red onion, chilli and roasted red peppers. 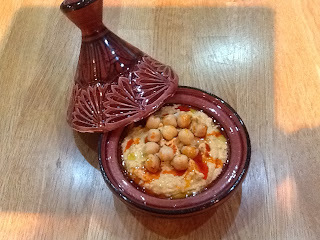 One of my favourites is to add approximately 2.5ml of Rosé Harissa and serve with some added chickpeas on top. This is my basic recipe but you can adapt to suit your own taste by increasing or reducing the amount of lemon juice and yoghurt. For seasoning I use Seagreens Mineral Salt which is a mixture of Hebridean seaweed and 50% Cornish sea salt. 3 - 4 tbsp of rapeseed or olive oil. Place all the chickpeas, tahini, garlic, yoghurt, oil and half of the lemon juice and seasoning in a food processor and blend until smooth. Taste and adjust the seasoning and if needed add the remaining lemon juice. This is a good healthy snack and would be ideal in lunch boxes or simply as nice light lunch. Hummus also makes a nice vegetarian starter with vegetables and pitta bread or on one big platter with the accompaniments for everyone to share. Add some extra small dishes such as olives, sundries tomatoes and its a perfect starter to a meal rather than a snack.